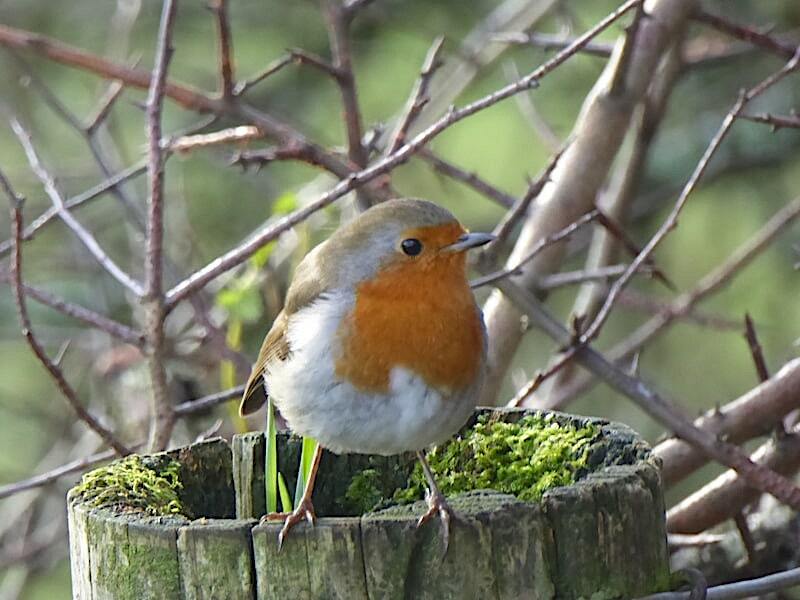 Short days combined with unpleasant weather does not for happy bunnies make. After a week of storms with gale force and bitter easterly winds, followed by a week of very low , very extensive and very grey clag, punctuated by frequent downpours, we were in danger of turning into troglodytes. Some days the cloud blanket was so low we could barely see the end of the neighbouring field, never mind the North Pennines across the valley, and at times it seemed as though the breakfast things had hardly been cleared before darkness descended once again and it was time to put the lights back on. 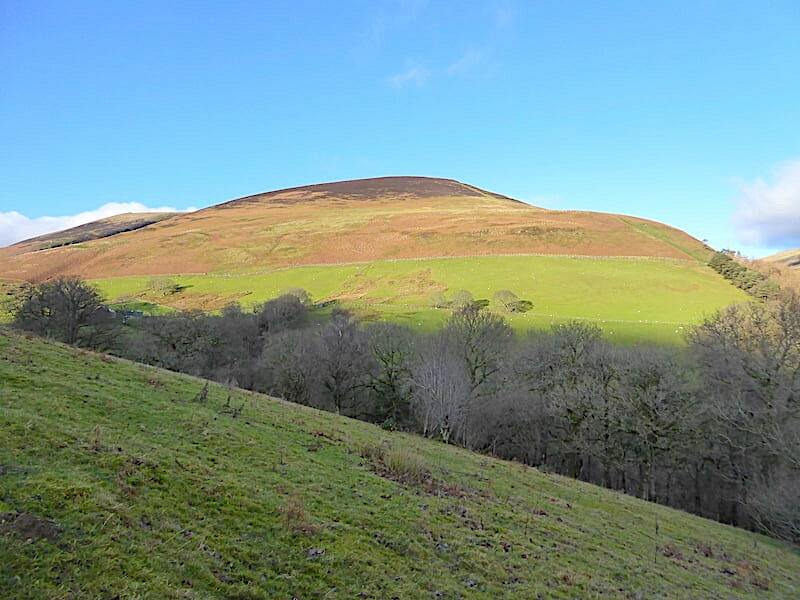 This morning looked as though it would continue in the same vein but around eleven o’clock the kitchen was suddenly flooded with light and squinting through the blinds we were astonished to see that bright blue skies and sunshine had materialised from absolutely nowhere. 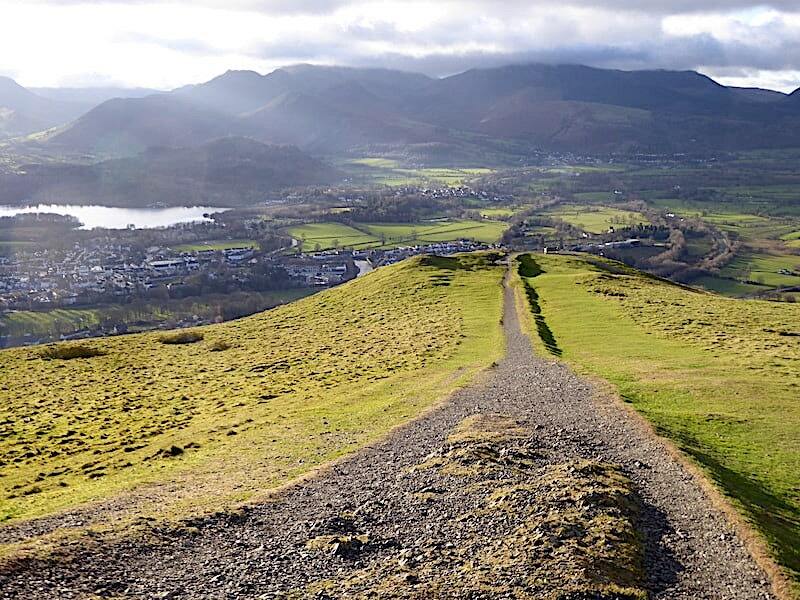 With a quick change into walking gear and a few refreshments stowed into a pack we dashed west to Keswick for today’s short walk up Latrigg, with just enough hours left on the clock to get there and complete the walk before the sun dipped below the horizon once again. Well, you can’t look a gift horse in the mouth, can you? 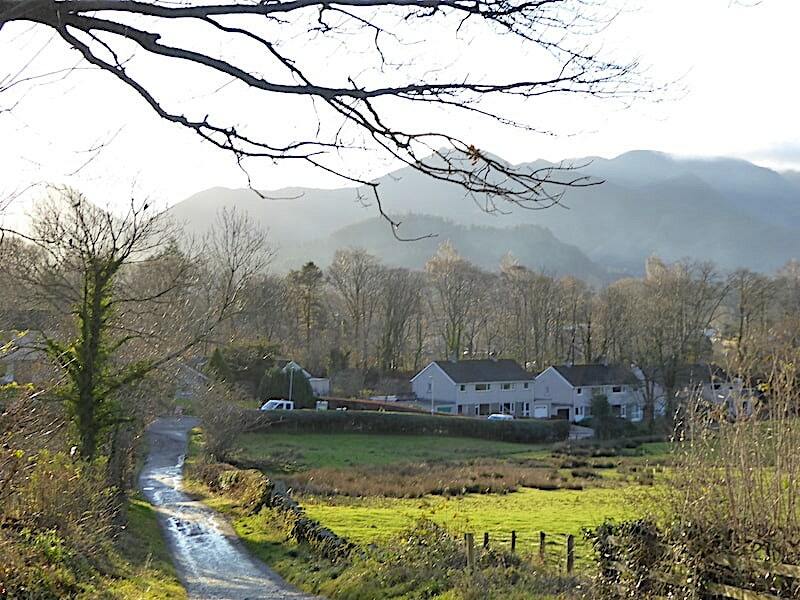 Roadworks, temporary traffic lights and a large number of workmen’s vehicles on Brundholme Road in Keswick made getting beyond them up to Spooney Green Lane a little awkward, but once past it all we were able to park up without any difficulty. 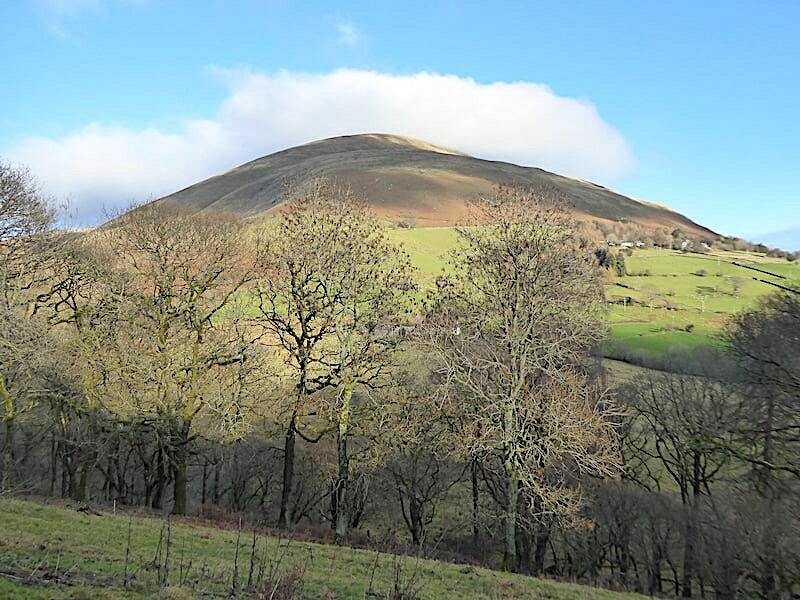 A look over the hedge shows the top of Latrigg enjoying a splash of sunshine. 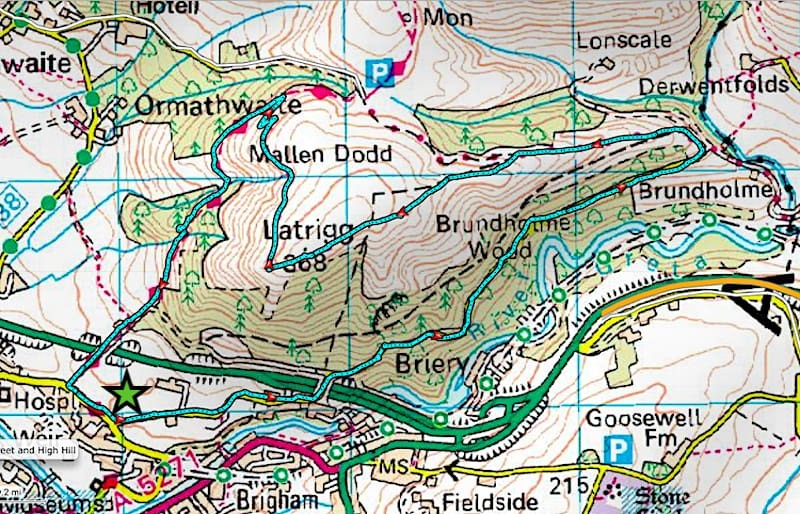 We make our way up the road, saving the Spooney Green Lane path for our return route, and eventually branch off to the left to make our way up to the bridge across the A66. 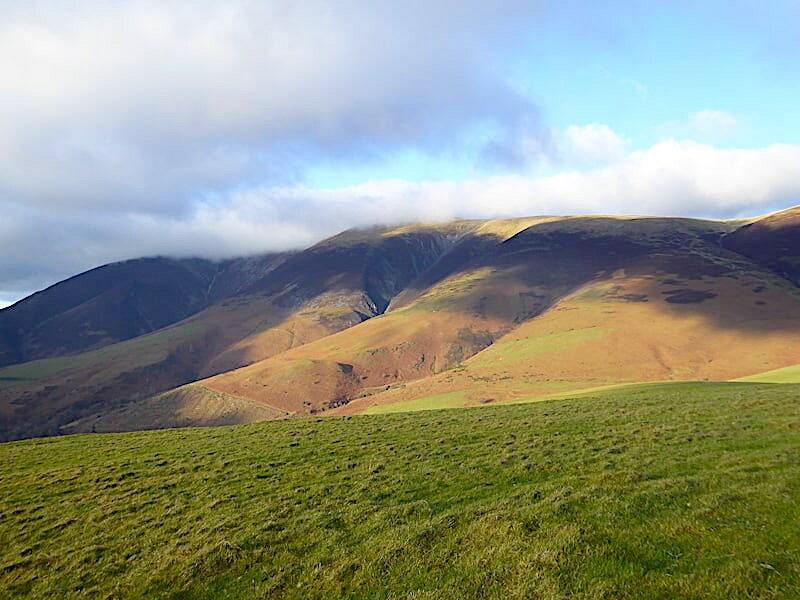 As we turned we had a good view of the cloud streaming over the top of Skiddaw and just clipping the top of Carl Side. 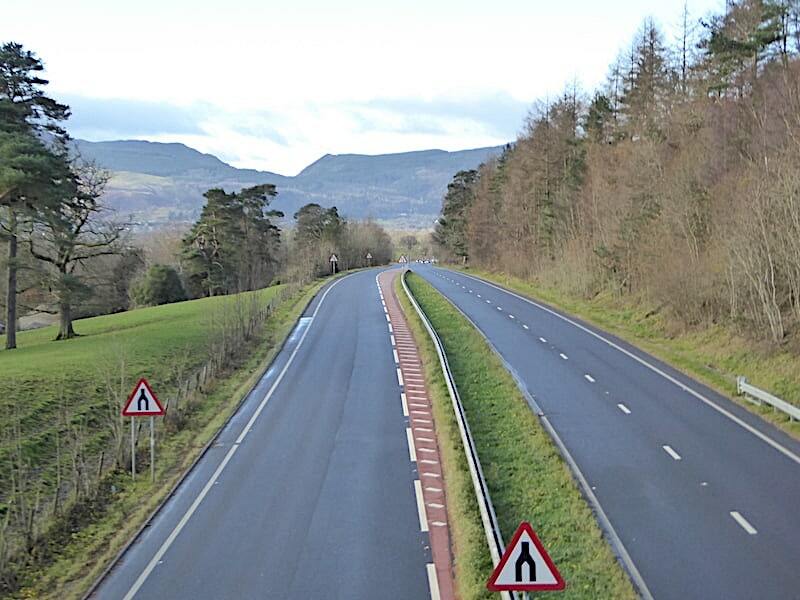 A rare occurrence, and for a few seconds only, we gaze down at the A66 bereft of traffic as we cross the bridge. Beyond the bridge we follow the old road through Brundholme Wood. 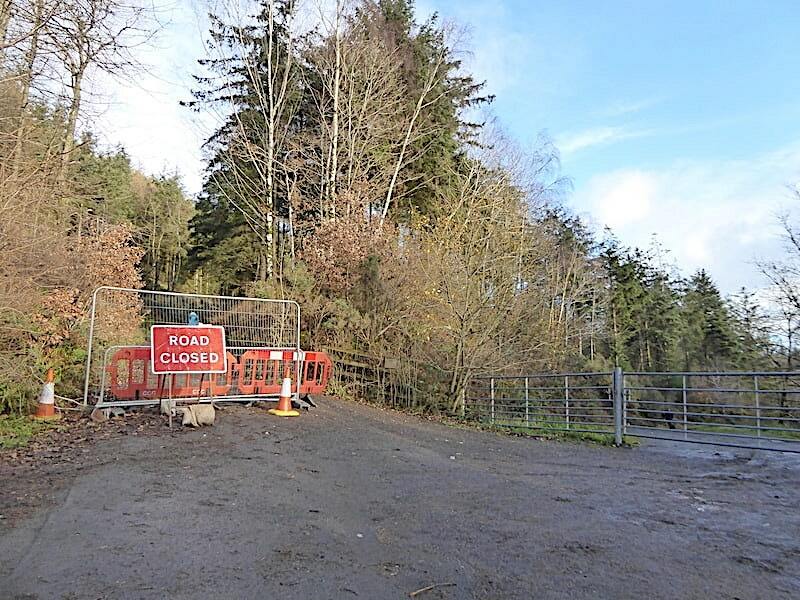 The road has been closed to vehicular traffic since 2016 when Storm Desmond and the resulting river flooding undercut the steep sides below the woods and caused several landslips. Will it ever be re-opened? 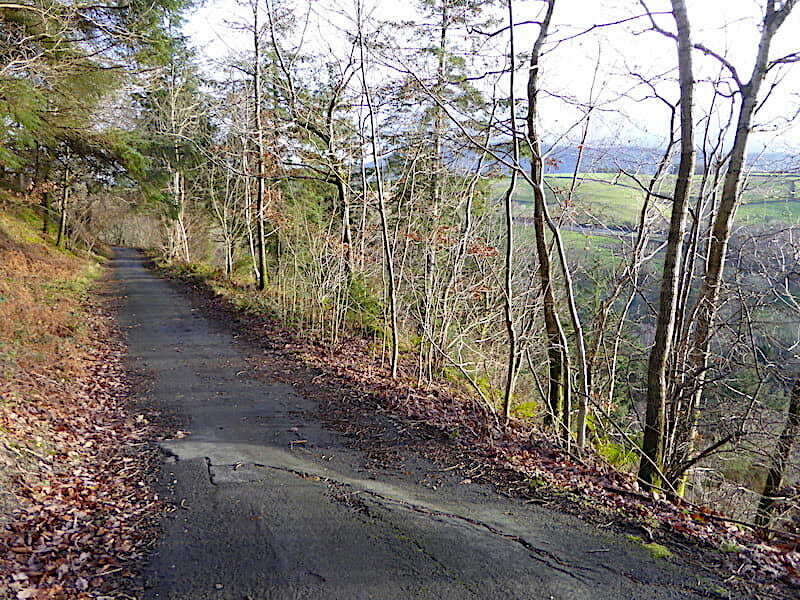 Its a very pleasant walk through the wood and the going underfoot is good for pedestrians and cyclists, not so for vehicles though with its cracked and uneven tarmac and a very steep drop on one side. 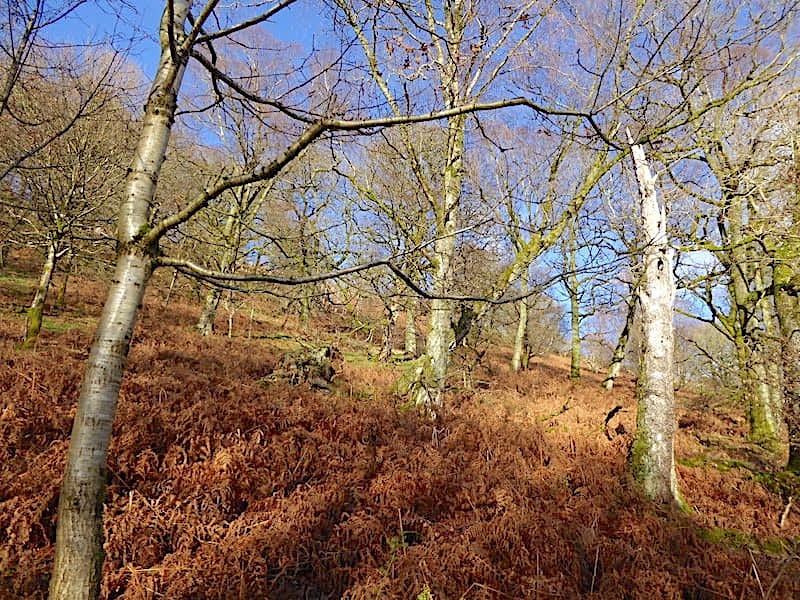 The fellsides were absolutely zinging in the bright sunlight and the brilliant colours were a feast for the eyes after a couple of weeks of nothing but dim grey light. 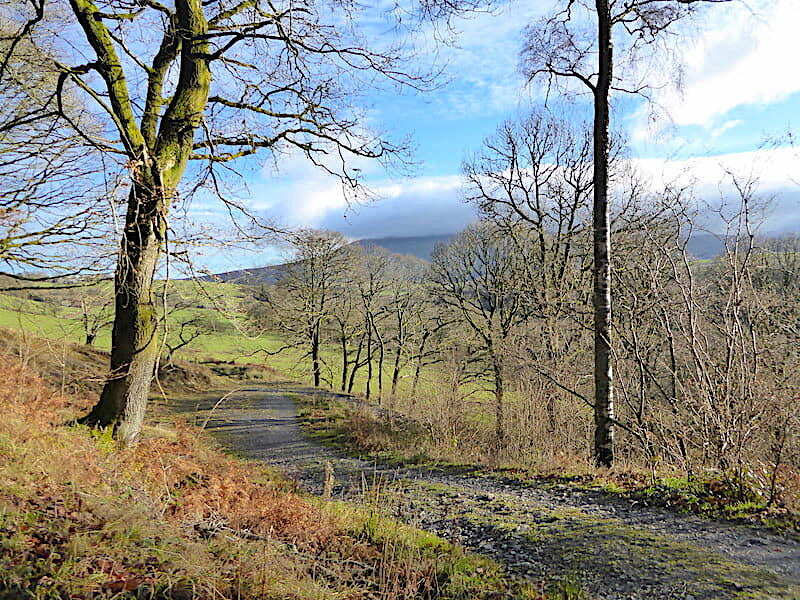 Further along the path there are fewer trees allowing a good view over to Clough Head and The Dodds although their tops remained hidden during our walk. 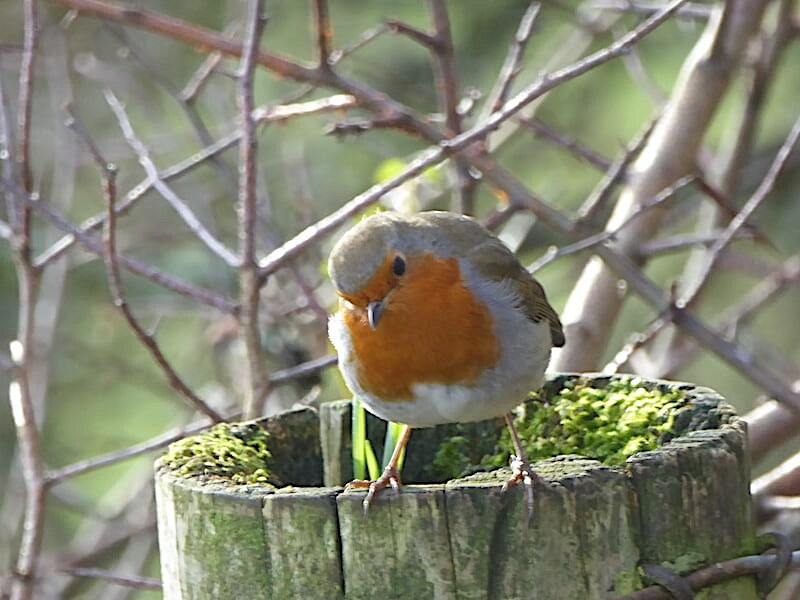 While I was taking this shot …..
….. this robin landed on a nearby fence post and gave us the once over. 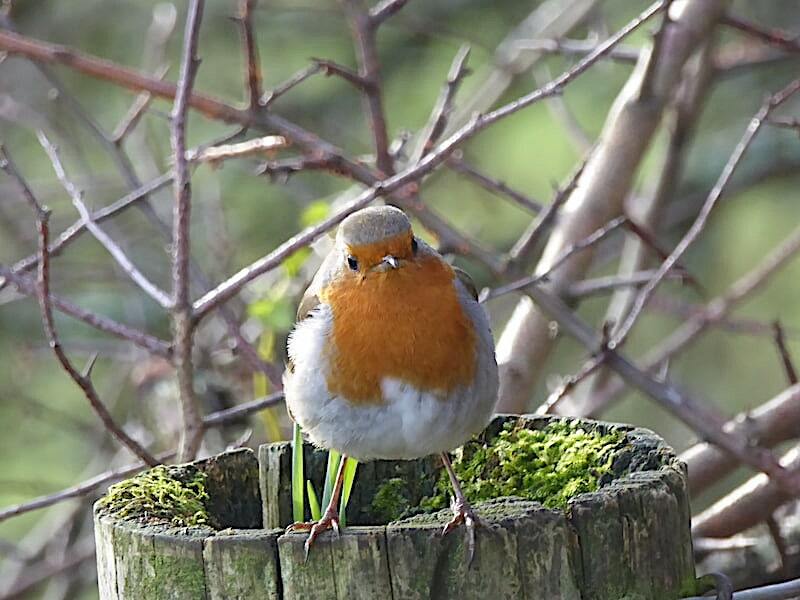 Here its giving J a rather quizzical stare …..
….. while I get a rather more detailed inspection …..
….. its head tilting this way and that, as if to work out why, instead of my eyes , it can only see this strange black thing in front of my face …..
Time to leave the tarmac road at this point where we turn up, pass through the gate and take the path on the right and begin the walk over Latrigg. 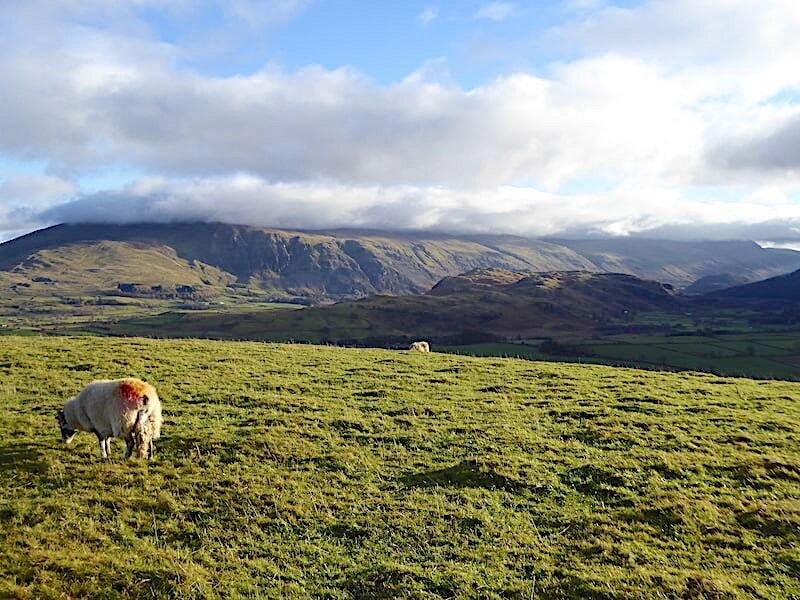 Blease Fell and behind it the cloud cap which covered most of Blencathra all day. 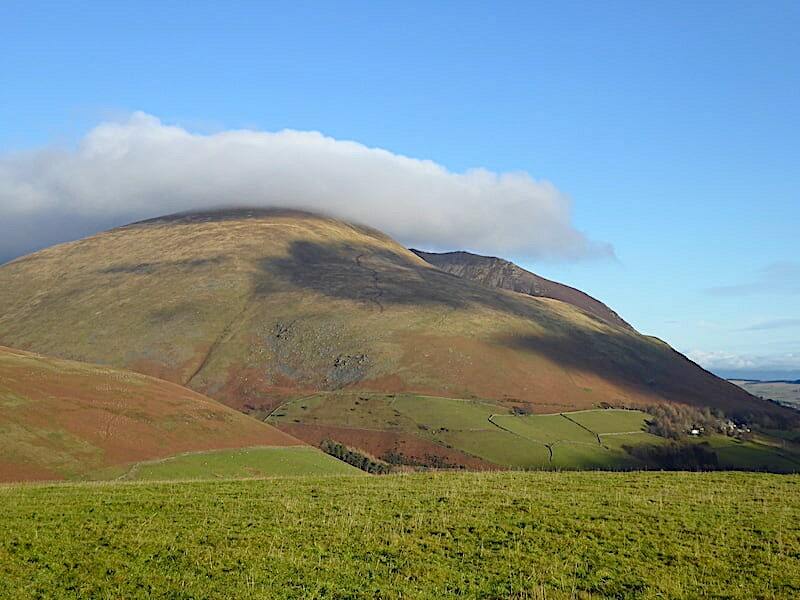 Lonscale Fell, Blencathra’s next door neighbour, stays cloud free though and glows nicely in the sun. 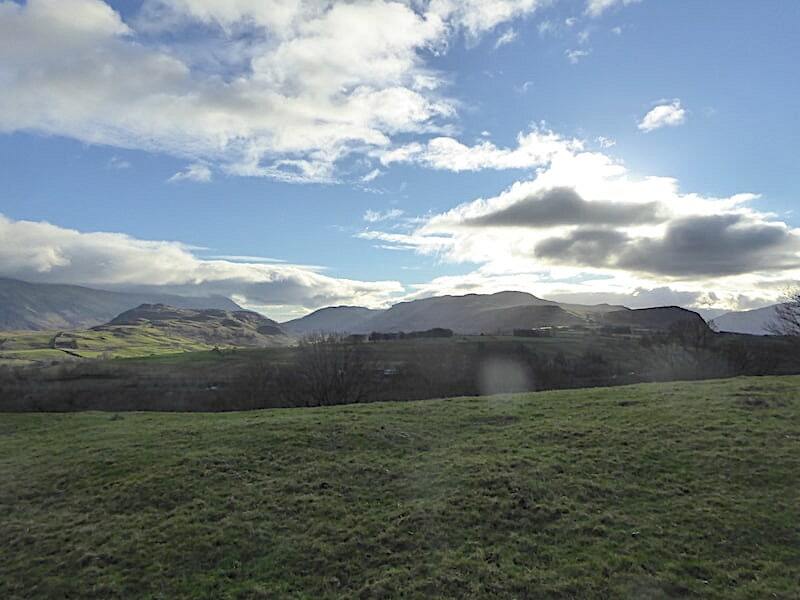 Only High Rigg is glowing nicely in the sun though where, looking south, Bleaberry Fell and High Seat are silhouetted against the centre skyline with Wall Crag jutting out over to the right of the shot. 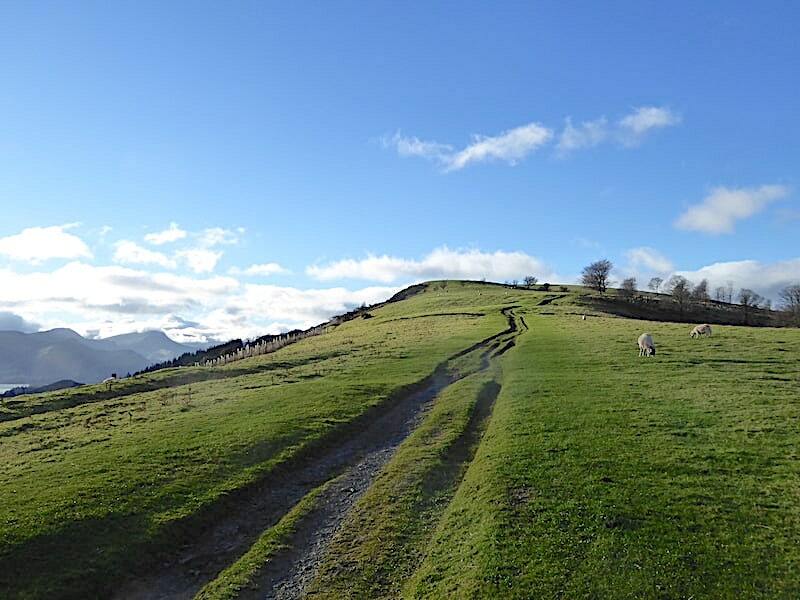 It doesn’t look like it in this shot but Latrigg was quite a busy little spot today and every couple of minutes or so walkers would appear up ahead. Dog walkers, solo walkers, twosomes, groups of three or four and a couple of fell runners, all taking advantage of the brighter weather to get some fresh air and exercise. 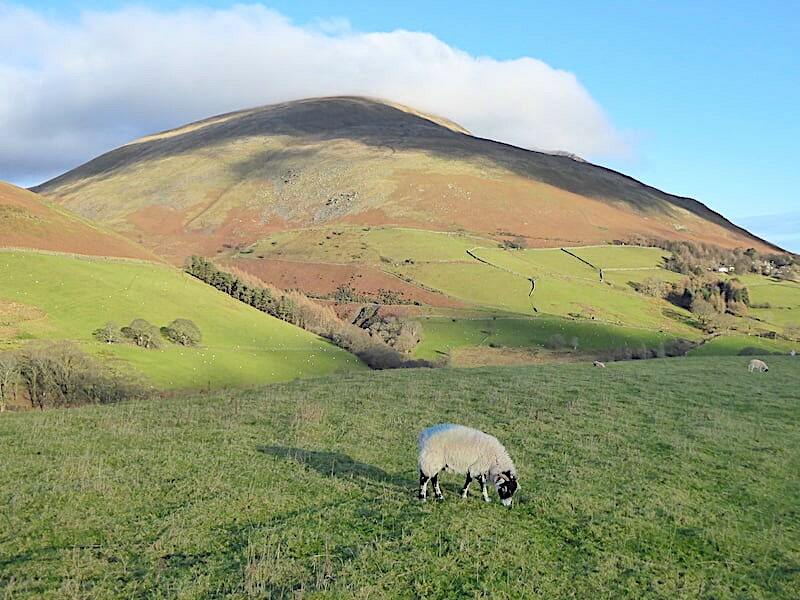 Latrigg is a handy little fell during the short winter days, the views from it aren’t to be sniffed at either. 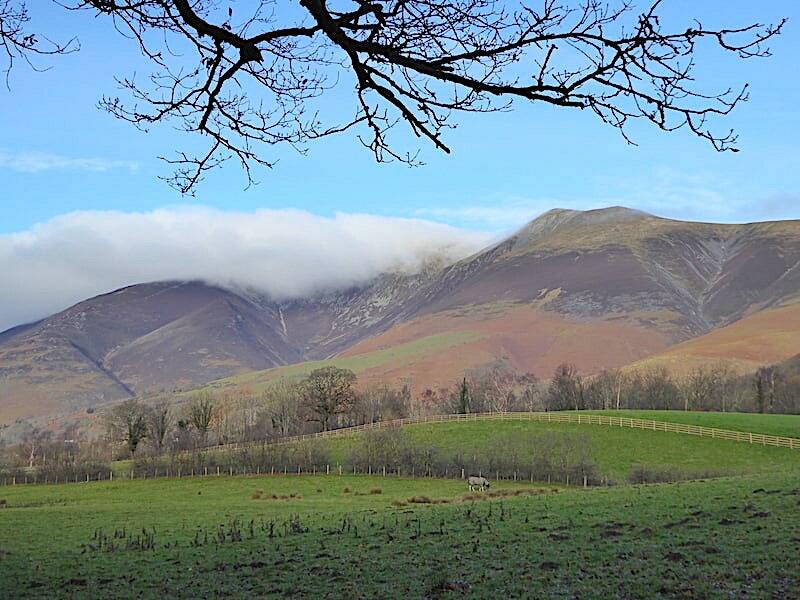 Cloud still streaming over Skiddaw as I take a look over towards Jenkin Hill with Skiddaw Little Man just about visible behind it. We’re picking up the breeze now and there’s quite an edge to it so every time my gloves come off to take a shot my fingers quickly become numb. I could do with a mini hot water bottle in each glove. 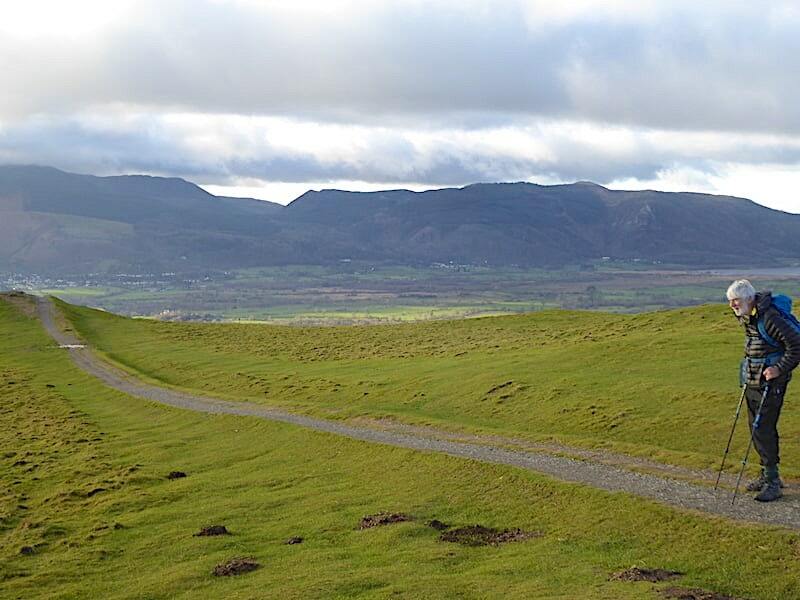 Another look back towards Blease Fell and the cloud covering Blencathra. 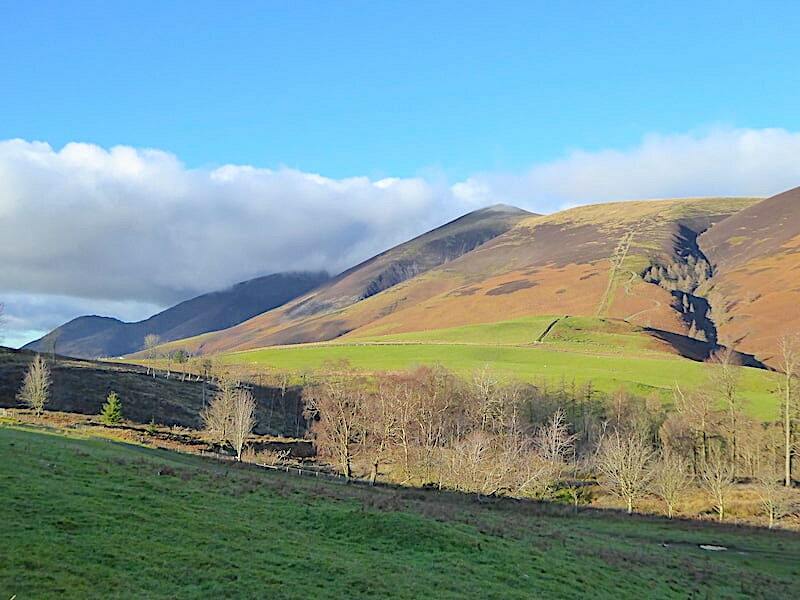 As we drove towards Keswick earlier all the lay-bys close to Blencathra were full, so there were plenty of takers for a walk up there today. Perhaps as they started out walkers were hoping that the cloud would eventually dissipate but it didn’t and it was still there when we drove back home again. The views would have been non-existent from the summit today so I felt sorry for all those who had toiled up. On the other hand it can be an interesting experience to walk through the cloud, even though its clammy wetness seems to seep into everything, so perhaps they weren’t too disappointed. A look back over my shoulder towards the Mell Fells and Clough Head over which the cloud seems to thickening rather than dispersing. 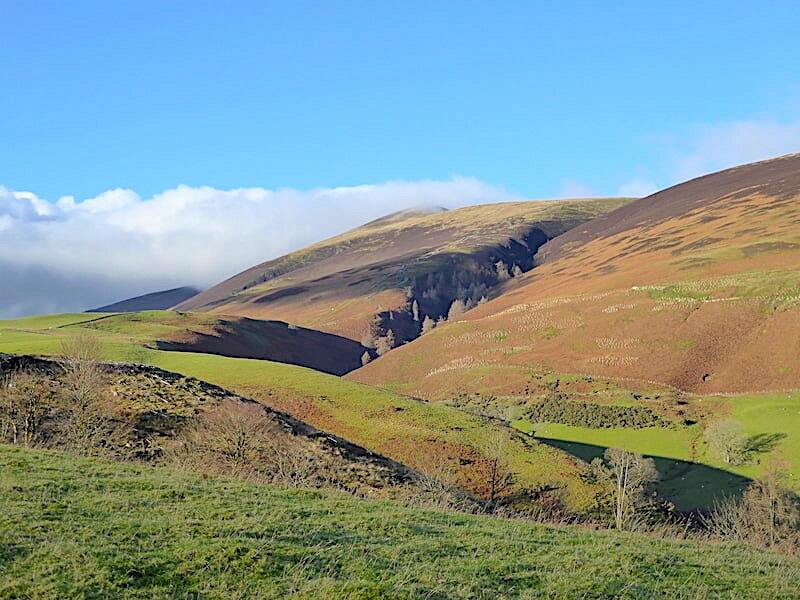 Looking over to Whin Beck and Jenkin Hill where even though the old path was replaced by the hairpin one ages ago it still seems to be taking a long time for it to disappear altogether. 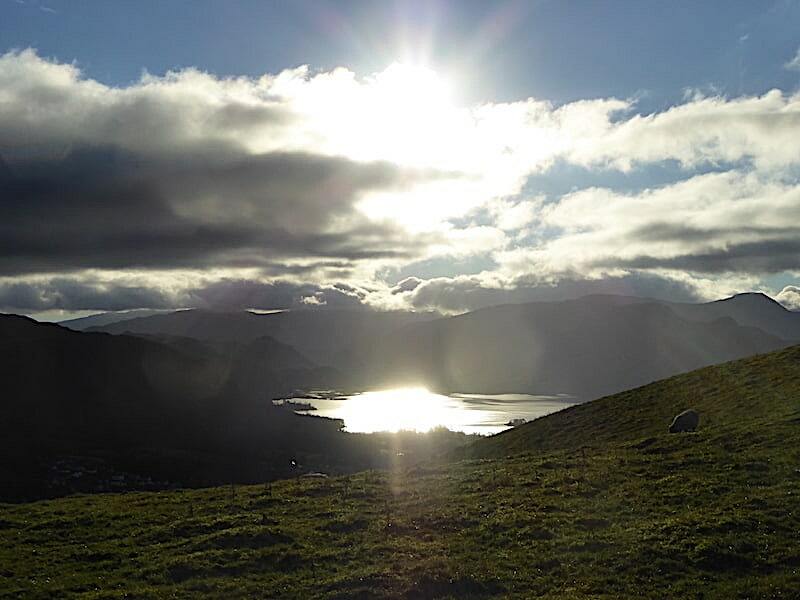 Sunlight falling on Derwentwater and creating a blindingly silver sheen over the surface of the water. 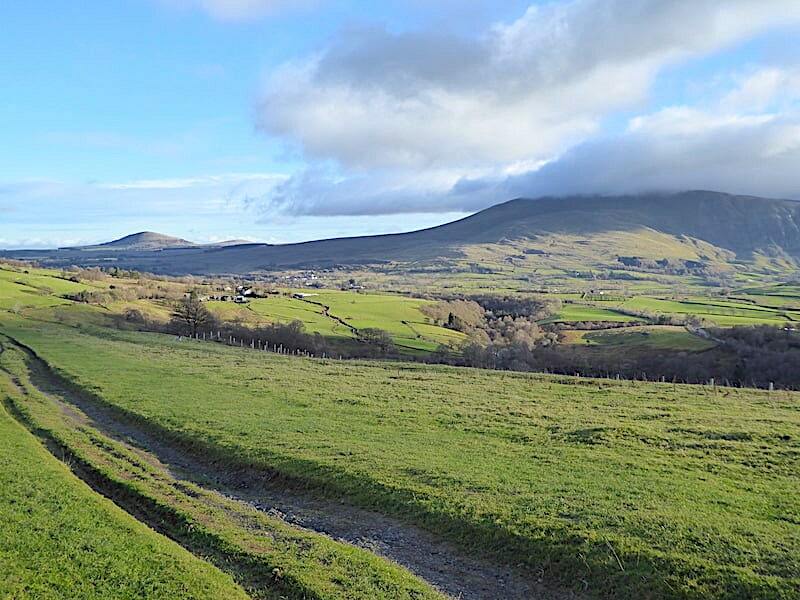 Another look back towards Blencathra where the cloud is now also covering the top of Blease Fell although more of the Gategill Fell ridge is now in view. All the higher fells had similar cloud caps today which made for some very fascinating views. Clouds which actually do something and add another dimension to the views are always welcome for me, I just hate that thick grey blanket stuff which just hangs around almost at ground level for days on end and simply doesn’t do anything, apart from bringing out the grump in me. There’s a little more definition to the slopes of Clough Head and The Dodds now that the light is bouncing off them a little more but the tops still have their cloudy blanket creating a very atmospheric view. 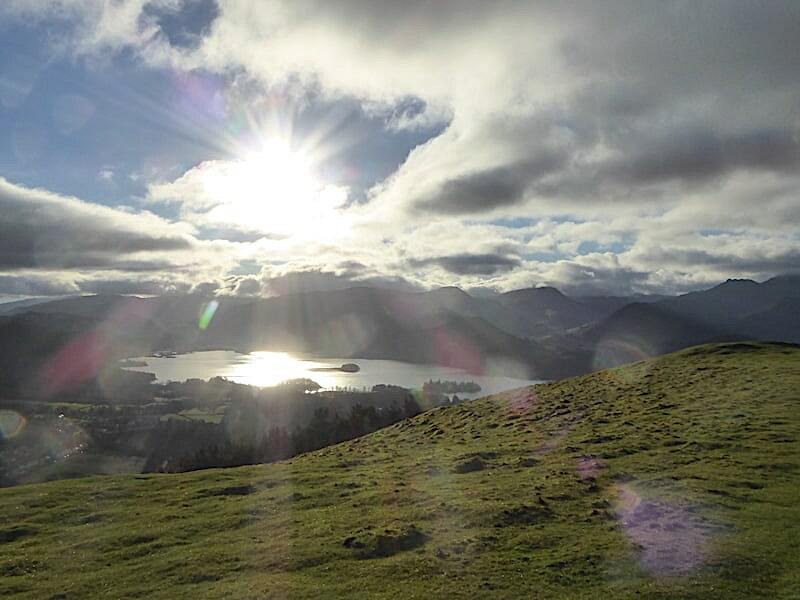 Sunburst over Derwentwater, so dazzling we could hardly bear to look at it, and behind it a froth of cloud effervescing and creating a bubbling cauldron across the fells beyond, magical. 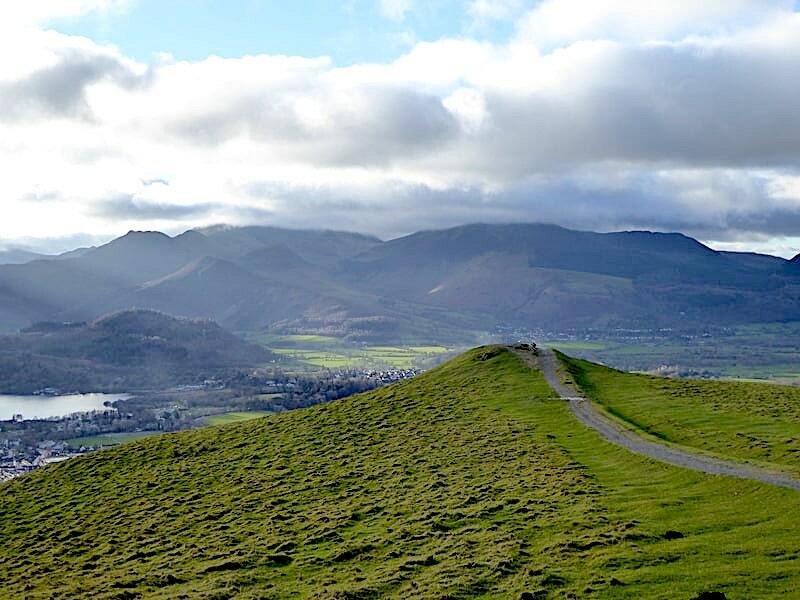 The instantly recognisable ‘knuckles’ of Causey Pike on the left skyline and just below it you might be able to identify, with the aid of a zoom and possibly a magnifying glass, the shadowy shapes of Barrow and Outerside. 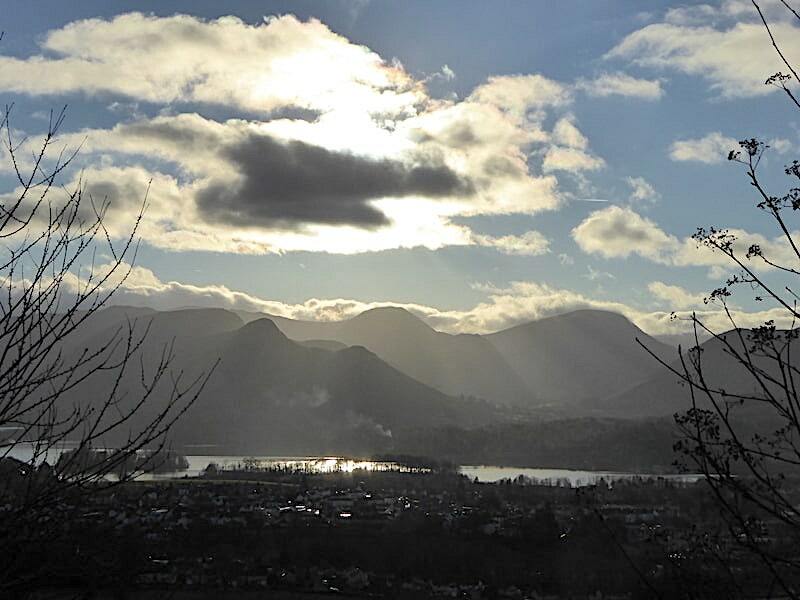 J takes in the view of Derwentwater while I turn my attention to the Whinlatter fells over on the right skyline. 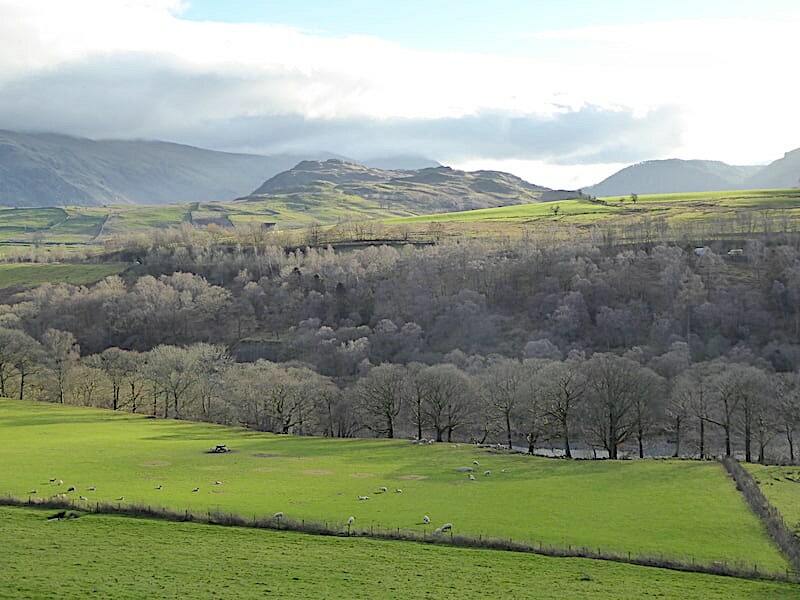 Below us is the sunny Vale of Keswick flanked by the subtle and shadowy contours of the north western fells. 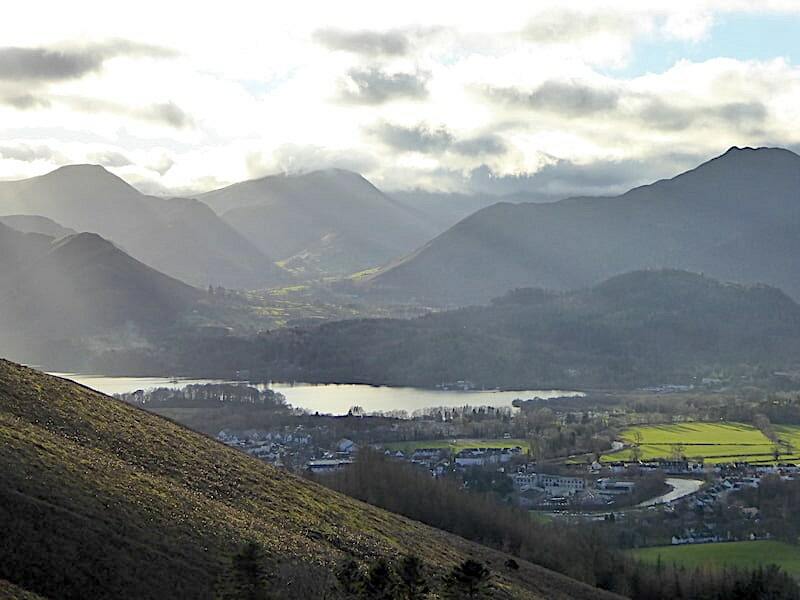 A zoom in across Keswick and Derwentwater for this view along a sunny Newlands Valley. 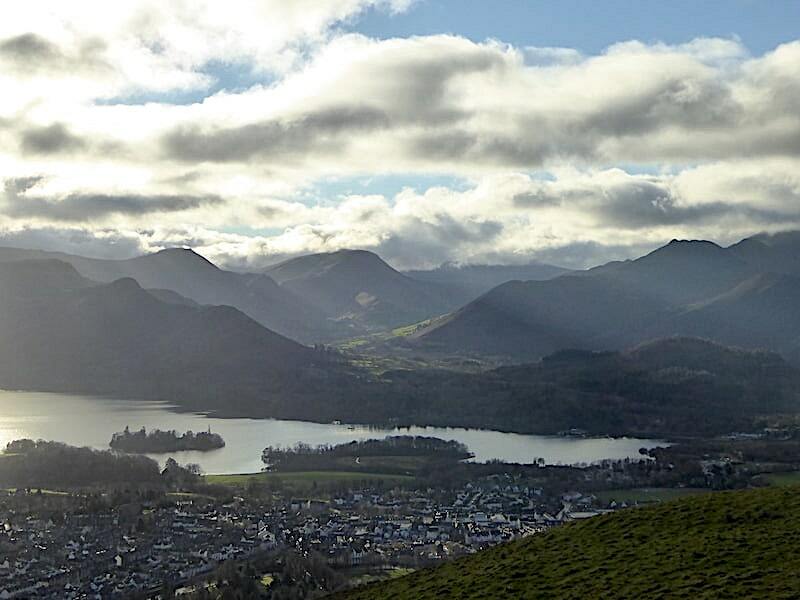 The distinctive shape of Catbells stretches along the Derwentwater shore on the left of the shot and behind them are the shadowy outlines of Hindscarth and Robinson. 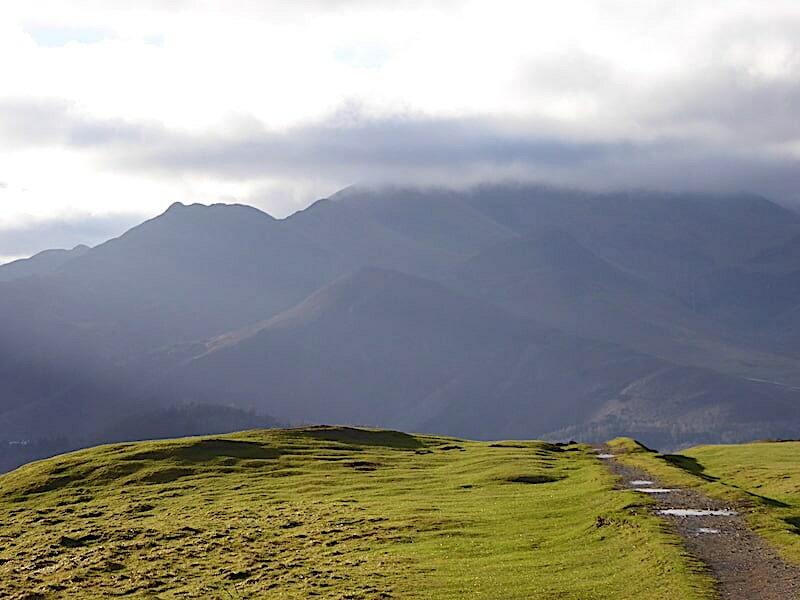 Causey Pike, over on the right, always catches the eye. 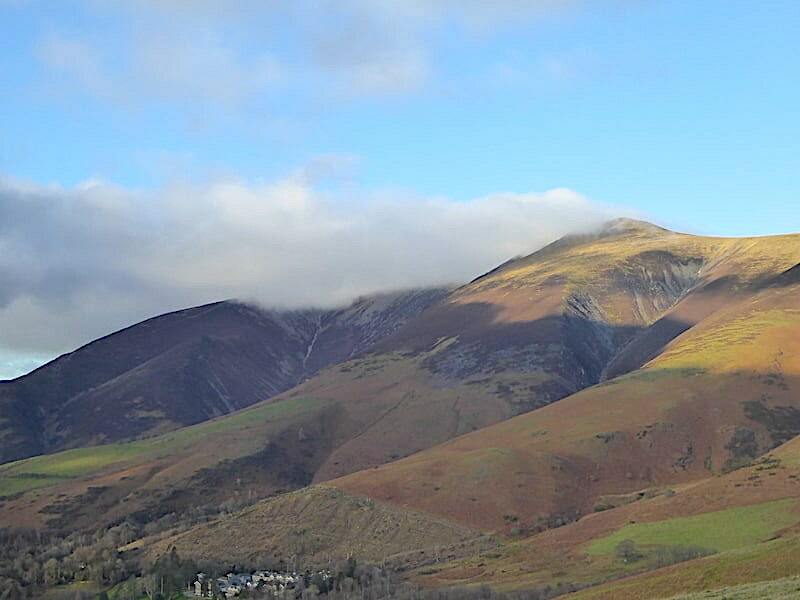 As was the case with Blencathra, Skiddaw also kept its cloud cover all day. A look up to Bass Lake with Dodd over to the right of it. Thicker cloud began rolling in from the west so the spells of sunshine eventually became shorter but fortunately the light didn’t go completely. 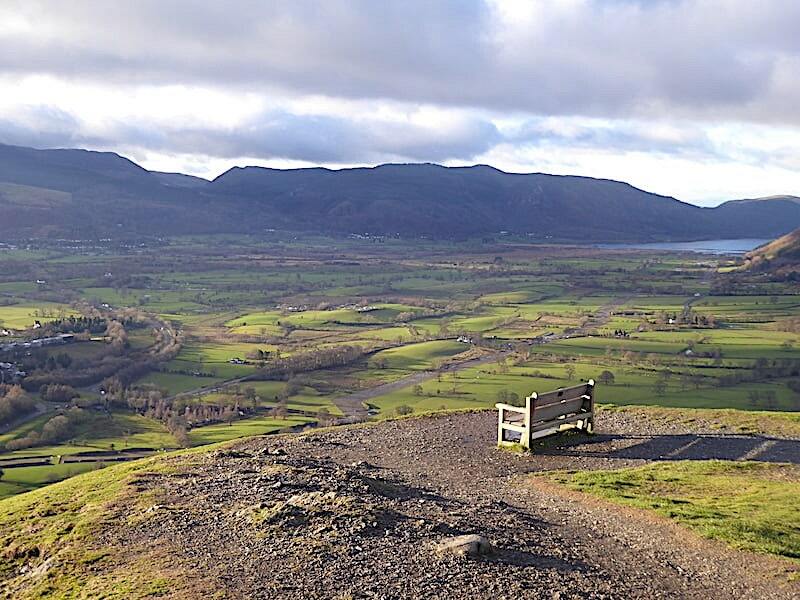 Making our way down to the bench and the viewpoint …..
….. where it was just a little too breezy and nippy to sit and take in the views so …..
….. we didn’t linger longer than the time it took to take a shot and then began making our way down the slopes of Mallen Dodd with this view of Skiddaw for company. 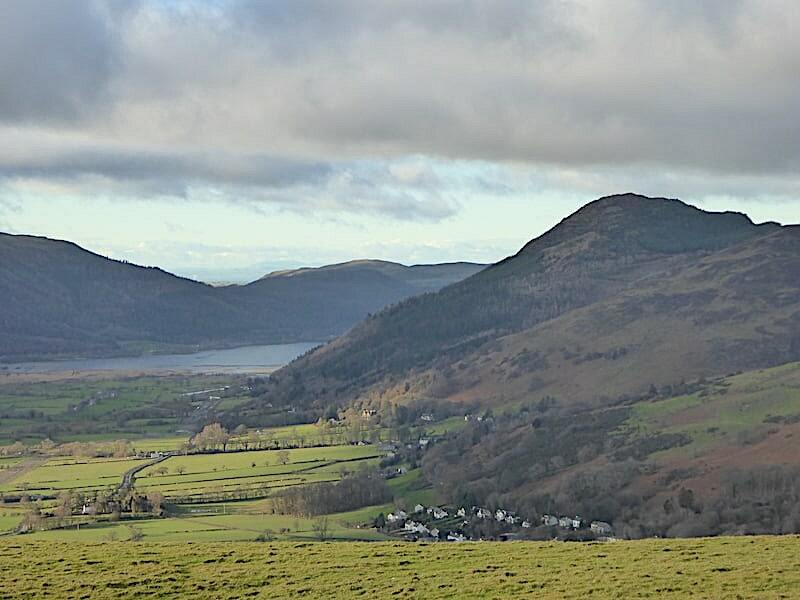 Another look over towards Newlands as we make our way down. We haven’t dropped down very far but already we have lost the breeze and have gained a couple more degrees of warmth in consequence. 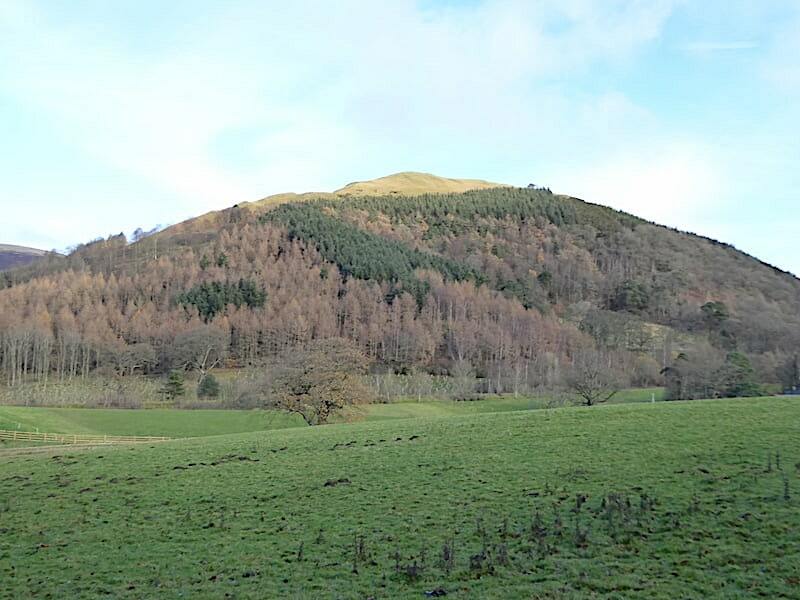 Much lower down now and passing below Latrigg Woods where a gap in the trees provided a view of the silhouettes of Catbells, Hindscarth and Robinson. 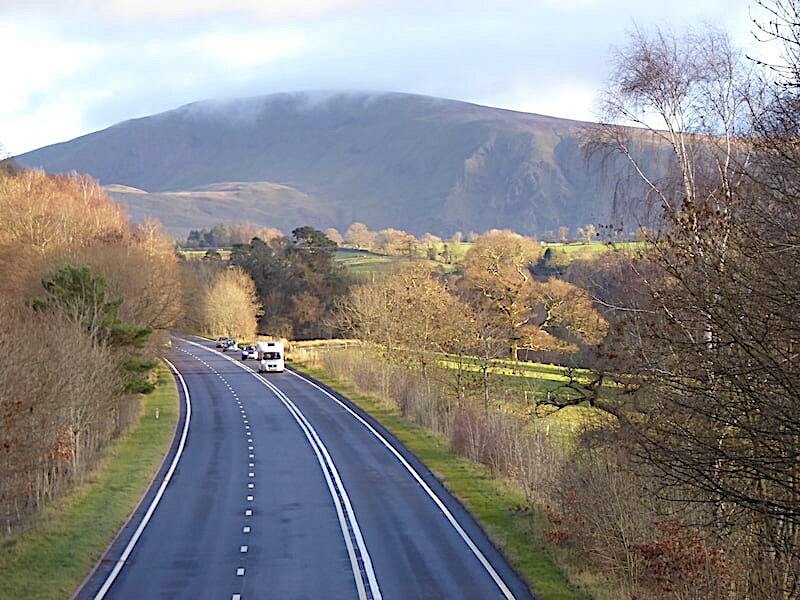 The A66 from the Spooney Green Lane bridge where a queue of cars is having to wait patiently, or not so patiently perhaps, behind the camper van. 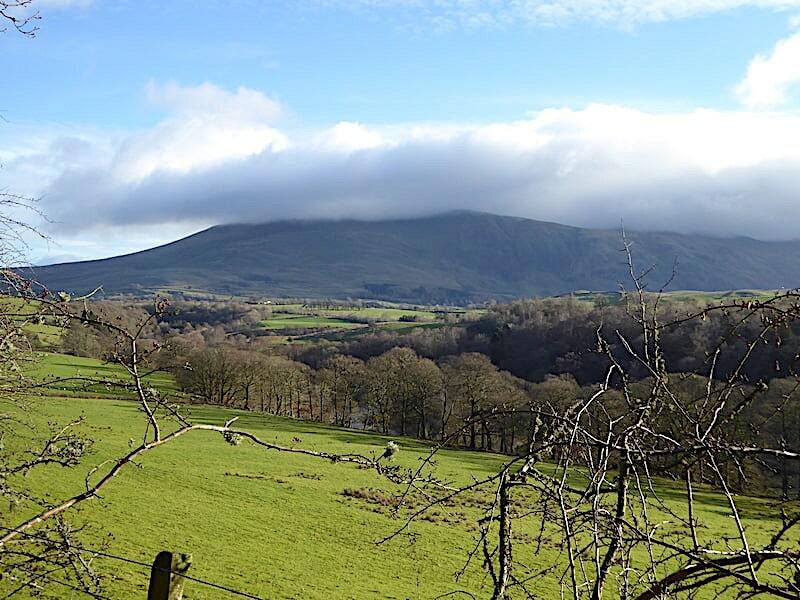 Clough Head has finally lost its cloud cap. 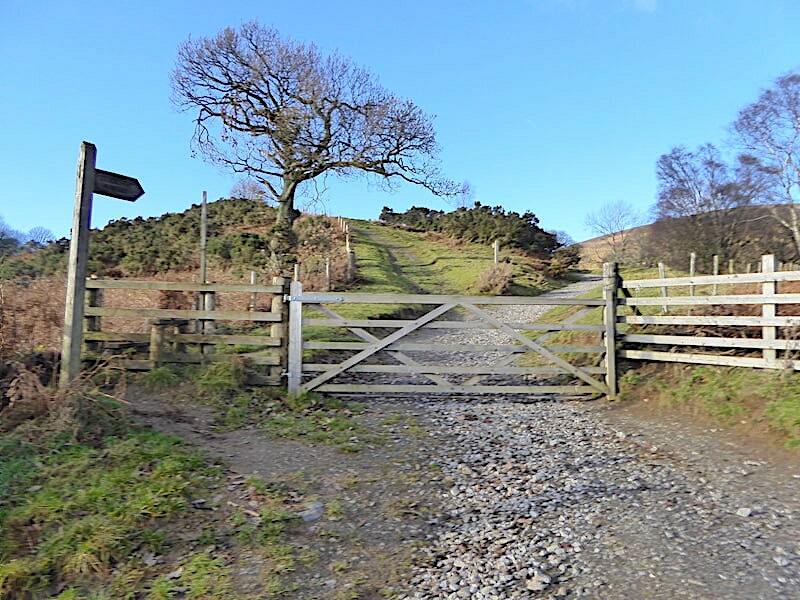 Another spell of sunshine as we reach the end of Spooney Green Lane and the end of our walk. The workmen’s vehicles are still around but of all the cars which were there when we arrived only ours and one other remain. I expect all their owners will have had as enjoyable a walk as we have even though it was only a short one and we’ve only been out for two and a half hours. The coffee, Mars Bar (what, no Mars Bar stop?) and other refreshments remain untouched in the pack. We’ve decided to have a very late lunch/early tea by stopping off in Keswick and treating ourselves to fish and chips which will mean that we won’t have to do anything when we get home, apart from put the kettle on that is. 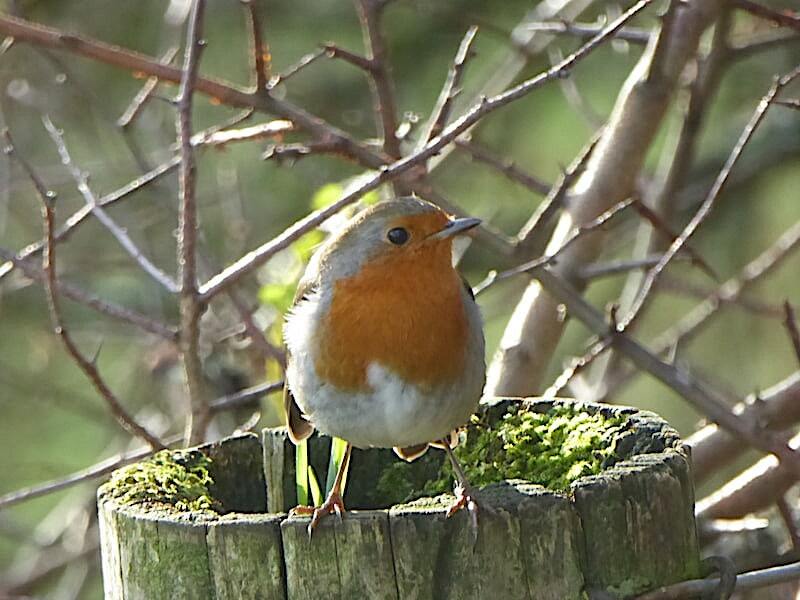 Good to be out again.